The ATL rankings improve upon the more widely referenced U.S. News & World Report rankings in a couple ways. For one, ATL’s methodology is simple enough to fit in one easy-to-understand image (unlike the Dickens novel you have to understand USNWR’s). Additionally, ATL places way more emphasis on things your average law school hopeful might care about—like how many grads get quality jobs and how much is law school going to cost—and less on things that the hopeful probably wouldn’t care about—like peer assessment rankings and the number of books in the library, two actual factors in USNWR’s rankings. That said, the ATL law school rankings have their flaws. Put simply, they do some massaging to make sure Yale, Harvard, and Stanford are never too far below the top three. They do this by weighing the number of alums that are active federal judges and Supreme Court clerks as 10% of the school’s final score. And in a naked attempt to keep the rankings within their intellectual property, ATL adds an ATL alumni score that no one, not even ATL, takes seriously. But their whole focus-on-outcomes-rather-than-inputs thing is definitely laudable. 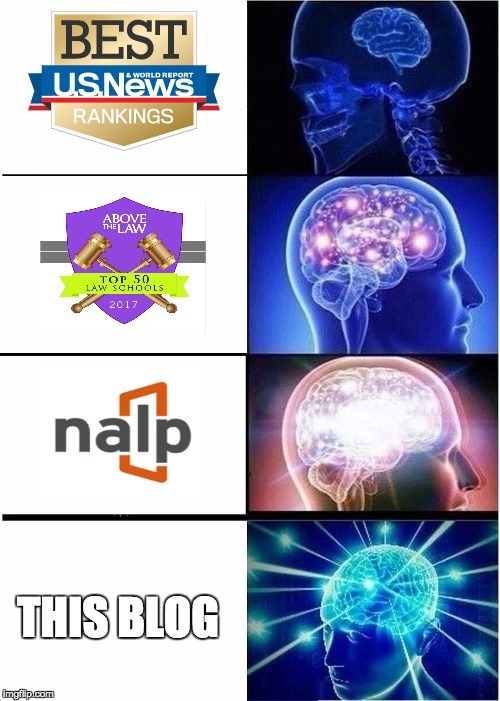 Here’s how I imagine a well-adjusted, intelligent law-school hopeful would treat the ATL rankings. You decide you want to go to law school and you want to know which law schools should interest you. So you spend about 15 minutes browsing the ATL rankings and compiling a list of about 6 to 12 schools you’re interested in. Then you look up the NALP data for each school—this is the employment or outcome data that forms the heart of the ATL rankings—and any other data relevant to your interests. Finally, you compile your own ranking based on employment factors that matter to you. For instance, if you worked as a litigation paralegal in New York and you know you want nothing to do with NYC litigation, but would love to work on deals there, you really don’t care about federal clerkships. If you know you want to do public interest law, then you mostly care about a school’s LRAP. If you don’t have the LSAT score to get into a top 50 law school but all you’ve ever wanted to do is work in a DA’s office, then you need to focus on law schools that have a reputation for sending a lot of graduates to DA’s offices. These are the kind of data points you cannot get out of any ranking. Finally, you should not come away from the ATL rankings thinking the University of Virginia is as prestigious—I know, I know it’s a dirty word—as Harvard. It just isn’t. Harvard will be better regarded than UVA no matter what ATL might say and especially what the rankings say year to year. Prestige is sticky—it doesn’t change year to year. So if you get into Harvard, barring a massive tuition break from UVA, you should go to Harvard. A very real and important beef ATL has with law schools is that almost all law schools refuse to further break out their employment stats so that we could, for example, tell the difference between legit JD advantage jobs and the Starbucks manager kind. This is where the University of Michigan Law School shines. Just check out their employment pages. ATL should heap praise on their efforts whenever possible.